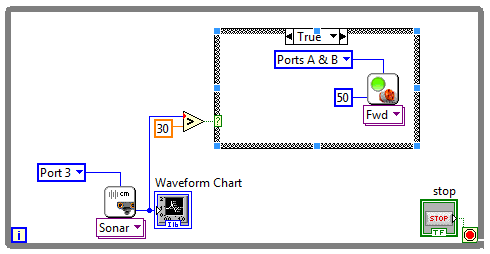 Why does this program work in LabView when targeted to computer but not to NXT? 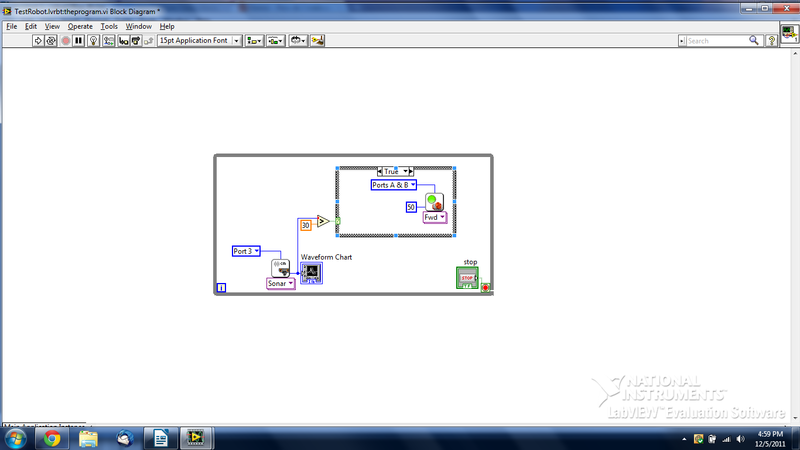 I have a program written in Labview for my LEGO Mindstorms NXT 2.0. When the target is set to the computer, the program works just fine. However, when I set the target to the NXT, the program doesn't work the same as when targeted to the computer. The program makes the robot go forward until it is 30 centimetres away from an object, which is detected by the NXT's ultrasonic sensor. Then the robot will stop. If the object is moved and there is no object within 30 centimeters of the NXT's ultrasonic sensor, the robot will go forward again until it is 30 centimeters away from an object again. Then, it will stop. This works when the target is set to computer in Labview, but not when set to NXT. When set to NXT, once the first object is detected, it will stop. But, if the object is removed and there is no longer any object within 30 centimetres of the ultrasonic sensor, the robot will remain stationary and not move forward. Here is a link to the source code for the program. Remove the waveform chart and change the stop bottom to constant 'F' and try it. When you target to NXT, the programm can not compile the waveform charts and many other things to NXT. Not the answer you're looking for? Browse other questions tagged mindstorms nxt programming labview or ask your own question. What can cause programmed NXT 2.0 motors to misfunction when small resistance is applied? Ultrasonic problems with the red and blue balls?